We just completed a poll we launched a few weeks back about what you, our readers, perceive as the most critical social media marketing trends for 2012, and these are our findings. Whether you work for a non-profit, government agency, Fortune 500 company, or are self-employed, if you use social media in your job (e.g., Twitter, Facebook, blog, discussion forum, Tumblr, YouTube, Slideshare, Google+, Weibo, etc. ), you will want to know the results of this poll! Article source – ComMetrics poll: Key trends for 2012? To manage these trends and stay ahead of your competition we suggest that, if you have not already done so, you join our 5,000 subscribers. It always amuses me when people claim to know the future, and I assume they gaze into their crystal ball or read tea leaves. Unfortunately, their thoughts and insights usually fail social media 101 in audience engagement, for instance by disabling comments. Go figure! Instead of going that route, I decided to ask you for your insights and draw on your expertise (see poll below). Thanks to all who participated; I really appreciate your help and support. Since we used an online poll, our findings are neither representative nor do they allow us to generalize. Nevertheless, they indicate some things that might cause you to reflect and re-assess your organization’s situation. 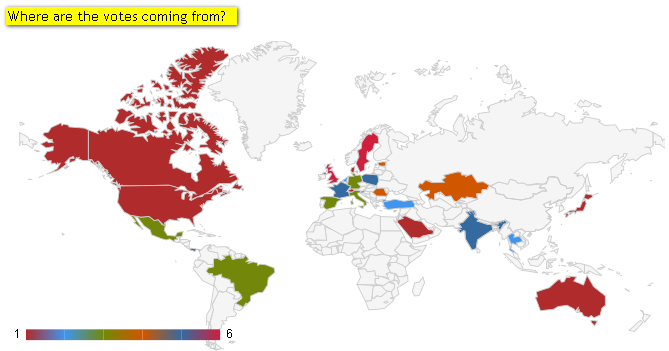 The map below shows what countries our 105 respondents came from (online answers & some replies via email). We also feel it important to mention that some respondents made the effort to let us know why they felt they should not participate in our poll, primarily because they did not use social media for their job. We appreciate your letting us know. 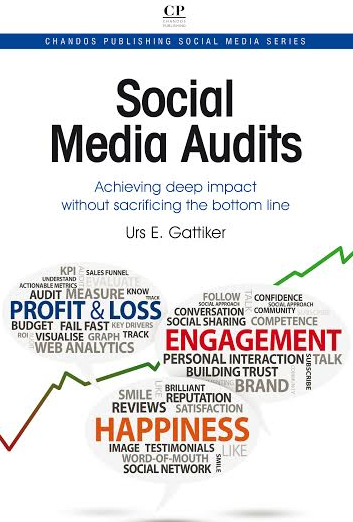 A study I recently came across stated the number one issue for 2012 for businesses and non-profits would be demonstrating how social media metrics would affect business value or insights. But according to our poll results, except for companies with 50 to 499 full-time employees, more effectively quantifying the value created for customers is not most critical for 2012. We could consider this a surprise, but it may simply indicate that our respondents are aware of the challenge and find others more critical to ensuring success in 2012 (see discussion below). Most find it understandable when companies with less than 10 full-time employees consider lack of resources a challenge, including but not limited to money, and time. As someone who runs a micro-business, I know that cash can be an issue for financing growth and it often seems there is never enough time to do as well as you want to with social media. But learning that large companies, such as Fortune 500 and FT Global 500 firms, agree the critical issue for 2012 is lack of resources really surprised me. I have no explanation for this. Do you? Please share your ideas in a comment below! Companies with 10 to 49 full-time employees reported their biggest challenge for 2012 is finding the right engagement metrics (33 percent, see table above). By contrast, only 13 percent of large companies in our sample felt this is most critical. Along with finding engagement metrics, some organizations (including non-profits) with 50 to 499 staff chose speed as the most critical factor in 2012 (27 percent respectively). This is definitely interesting for those trying to be prepared for crises, unlike companies who appear unable to respond over the weekend AND/OR use the wrong tone when replying to their fans or brand ambassadors. As Robyn McIntyre points out above, making sense of all the advice coming our way about how best to use social media makes it a challenge to do things well – who is right? People could fill in their most critical issue under the category of Other. The results point out that context REALLY matters (see also replies below). Accordingly, you have to make sense of it all as it pertains to your unique situation. Templates may fail and instead you must consider what works for your organization and target audiences, allowing you to choose the most viable strategy for your organization. Finally, we were surprised to note that, regardless of country or firm type, none of the respondents felt privacy or data protection would be most critical in 2012. I wonder if companies are underestimating this challenge… What is your opinion and does your organization address this issue? Leave a comment or should I beg you to befriend us on Google+? Let’s follow my new motto for 2012 instead and meet face to face over a drink (call me or send me an email – I would love to meet you!). Just make sure you enjoy the upcoming holidays with real people – not in cyberspace. Tip: Search for more information about social media and more effective marketing in 2012 – trends from CyTRAP – ComMetrics (click to query). What is critical for you may differ depending on your size, and even region matters. We are in the process of completing a CyTRAP poll in German with respondents primarily from Germany, the German-speaking part of Switzerland and Austria. Here privacy and data protection was far more likely to be a critical issue for 2012 (see above). 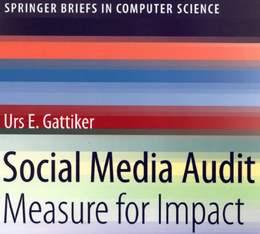 Great point, @ComMetrics:twitter Measurement is a crucial part of making strategy. Unfortunately, this works only if you know the question you are trying to answer. The current abundance of metrics is leading us down the wrong path. We are substituting meaningless and often baseless indicators with more meaningless stuff. In contrast, I find this survey interesting even though you state it is just a small one and not representative. I just wonder how the Fortune 500 folks handle the engagement issue if it is not their most critical one? What you think? Roberto, thanks for your feedback this morning. 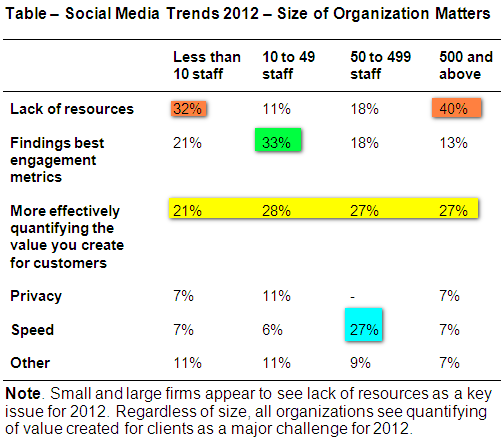 ==> “More effectively quantifying the value you create for customers”is the most critical issue for 2012. Accordingly, this indicates that even Fortune 500 companies – at least a large group it looks like – tries to tackle the issue of measuring these effects sensible and quantifying the outcome. Not an easy thing to do as you and I probably will agree. 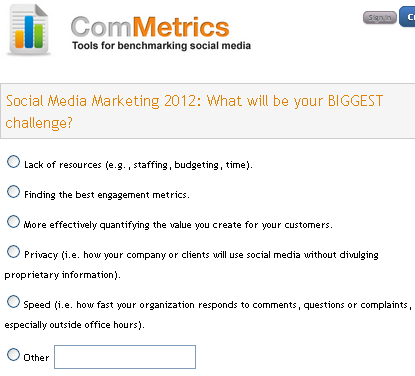 http://t.co/evoQae0i – ComMetrics poll results: Key trends for 2012? Previous post: Could Google+ fail in 2012? Next post: 2012 trends: What makes a failure?